Foxes Makes and Bakes – Being creative is my passion. I hope you enjoy reading about my crafty experiments! As this is the first time I’ve written in 2016 I’d better say a very belated Happy New Year to you! Friday was my birthday and I had a really wonderful day. My partner and I went to Betty’s in Ilkley for lunch. Rhys had some delicious sausages and I had a fish gratin. Both came with rostii – my Betty’s favourite! Then we picked up some goodies to take with us to my mum’s house to share with Mum and Dad over a cuppa. Sadly they had run out of vanilla slices which are Mum and my favourites but we enjoyed our treats very much. Finally it was time for the main event. Rhys had bought my tickets to go and see the Strictly Come Dancing tour which was in Leeds on my actual birthday no less! What a fantastic show they put on. I saw the tour two years ago and this year it was even better! How I would love to be famous – just for the chance to get on that show! To top it off Anita Rani and Gleb won the show on the night which was fab as she’s a local girl. In fact she was about 5 years above me at my school! Her dances were very dramatic and it was fab to see her win as she was knocked out of the show in the semi final. Another highlight was getting to see That Jive! 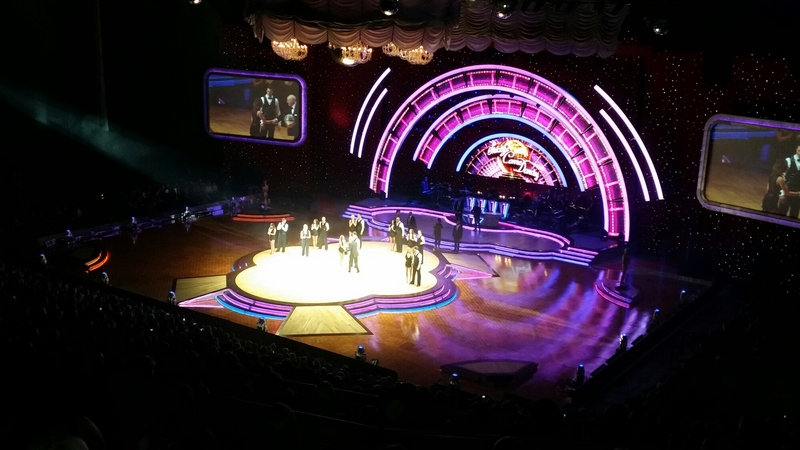 Jay and Aliona’s Pulp Fiction – inspired Jive from the series. It was one of the best dances ever on the show in my opinion. Oh dear I sound like such a Strictly geek. Well hey ho, I guess I am just that! 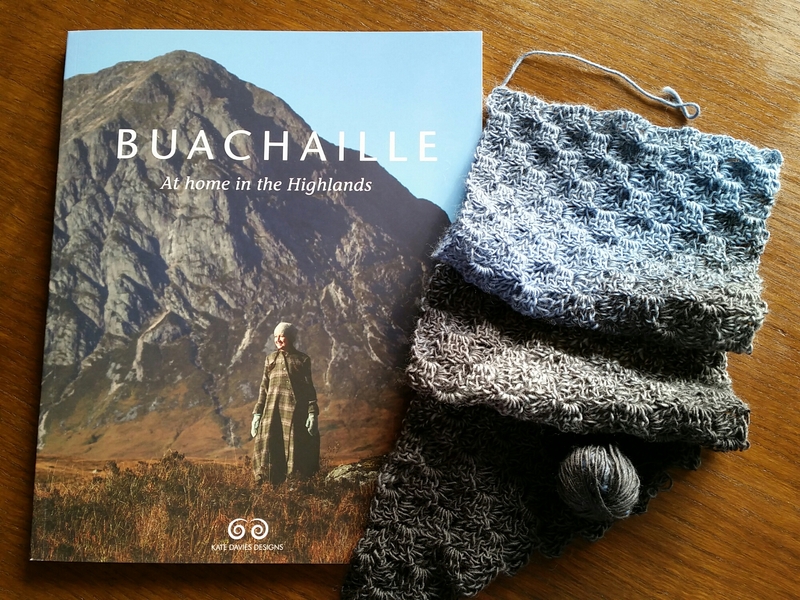 Rhys also bought me a beautiful necklace and Kate Davies’ latest knitting book Buachaille. Her books are so much more than just knitting patterns and this time she has included some of her husband’s traditional Highlands recipes. I can’t wait to try the cranachan! The beautiful book even matches on of my crochet WIPs (not from Kate’s book!). It’s a short cowl I’m making from left over sock wool. 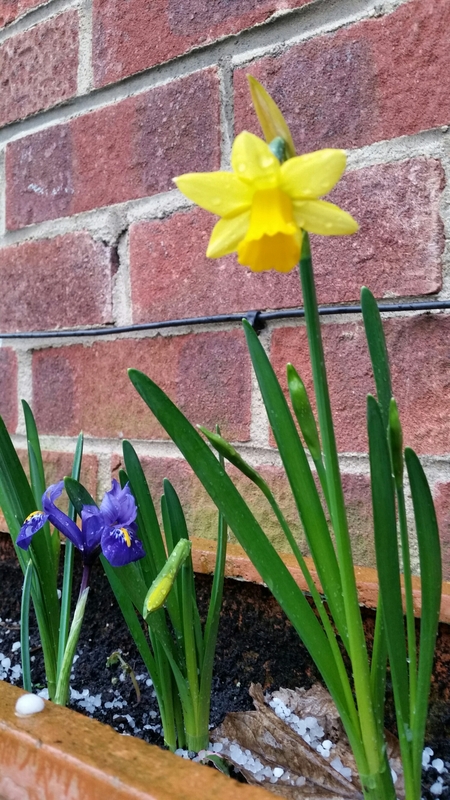 The first daffodil and iris of the year flowering in one of my pots in the garden! It’s so strange that they are out before the snowdrops though but how it made me giddy! During the week I’m still leaving the house in the morning and getting home in the dark and so I haven’t noticed these delights happening in the garden. It looks as though there are plenty more nearly ready to come out and some crocuses too. Roll on spring time! Here’s a little example of why I’ve been struggling to find time to blog recently. 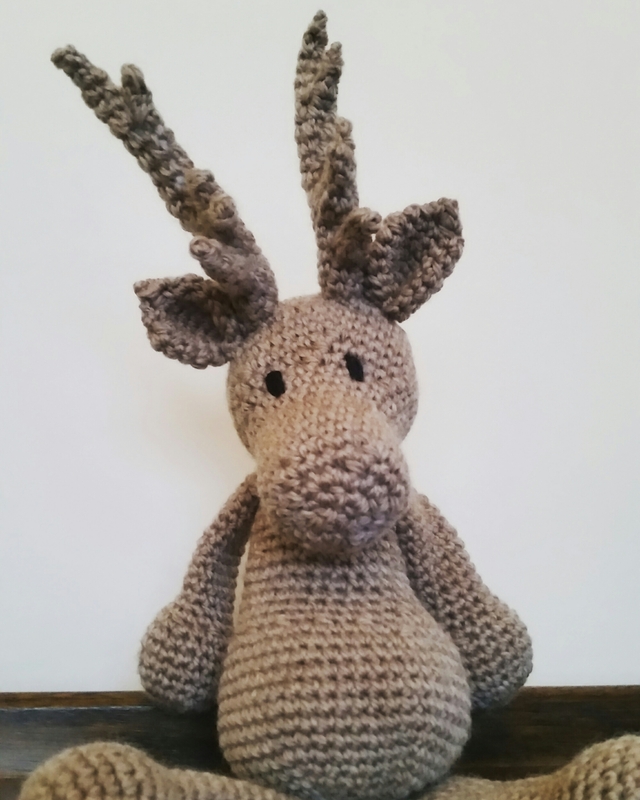 Meet Donna the Reindeer from the amazing Edward’s Menagerie collection by Kerry Lord of Toft Alpaca. She was at the top of the list of projects I wished to complete this year as I didn’t have time to make her last year. I’m very satisfied with her, not least because I’m not terribly confident with embroidering the faces and she only has eyes to contend with; no nose or mouth! I am also hoping to complete a pair of crochet gnomes (you may have seen them in a recent issue of Simply Crochet magazine) and a Christmas tree skirt. This is in addition to some gifts I’m still hoping to make and all the other usual Christmas preparations. So much to do, so little time! There is also the matter of the International Diploma in Crochet that I have decided to undertake AND preparations for my very own crochet classes that I start teaching in the New Year at Dolly’s Craft Corner in Bradford! I’m not quite sure how I’m going to get everything done around work and Christmas socialising but I usually find that if you just keep going everything has a way of working out in the end! Posted on December 9, 2015 Categories Christmas, Craft, CrochetTags Crochet, Ed's animals, ToftUK1 Comment on Christmas chaos! 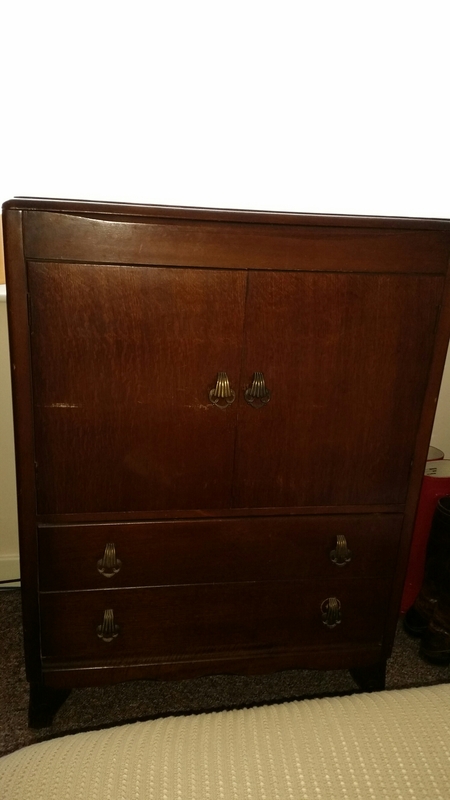 At the weekend we acquired not one but two new pieces of furniture. I say new but neither is actually what you might call “box fresh” but they’re new to us! 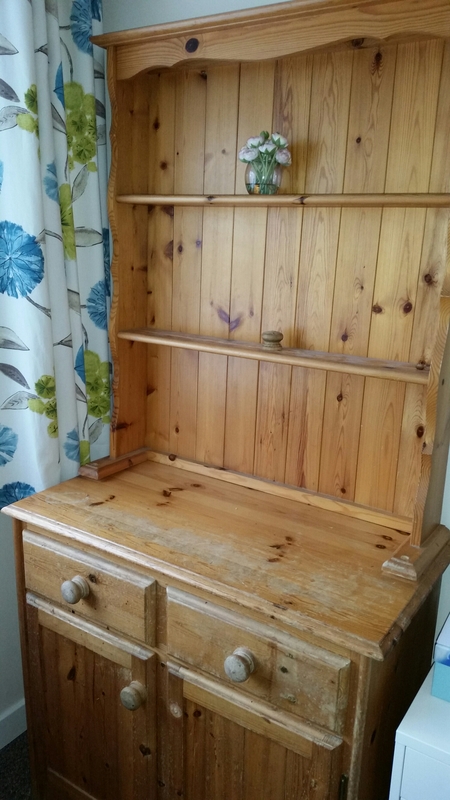 The first is a pine dresser which was kindly given to us by friends who no longer need it. I had originally planned to renovate this for sale but I’m now thinking I might keep it to store my craft supplies in the spare room. The second is a vintage tall boy. 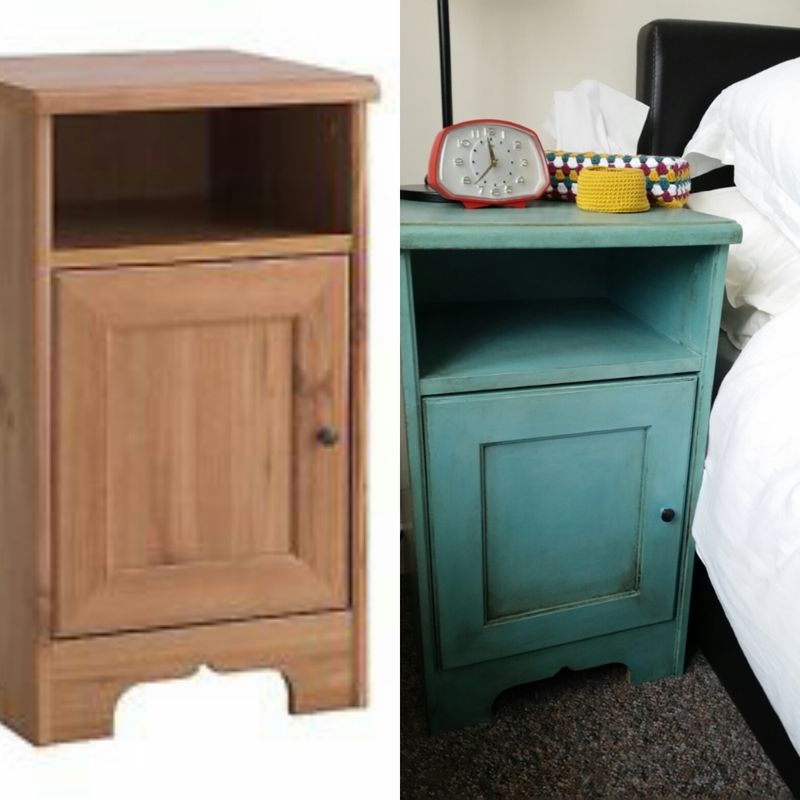 This is going to be my OH’s new (rather large) bedside cabinet. He doesn’t have enough storage at the moment and so I get frustrated that his side of the room is always messy and I can’t clean it properly! We bought the tall boy from a local charity shop called Pass It On Vintage. I could’ve gone a bit mad in there and bought so much! It was great and I’m sure I’ll be going back at some point. For the dresser I plan to keep it simple as my craft supplies will provide lots of colour and interest. 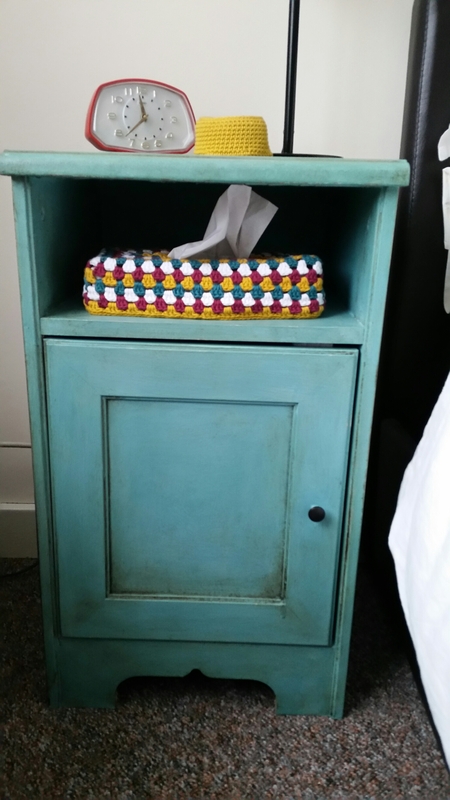 The plan is to clean it up, sand it only where necessary and then paint with Annie Sloan’s Old White followed by clear wax. At this stage I haven’t decided what to do about the handles. I think I might get some new ones but actually quite like the chunky pine originals. For the tall boy I plan a complete colour change to go with our bedroom decor. 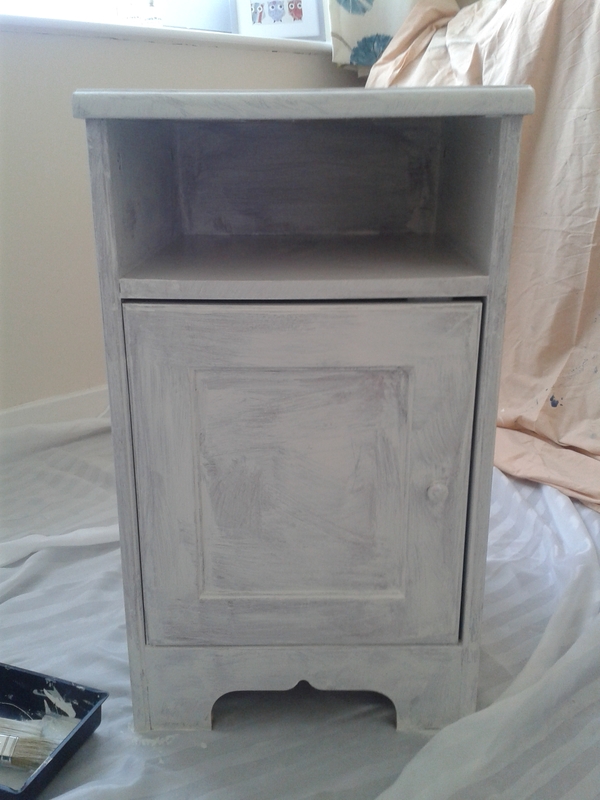 I’m also going to have a go at making my own chalk paint for this one! We’ve had a tester pot of our chosen colour made up (on offer for £1 in B&Q!) and some plaster of paris to mix it with. You could only get it in 2.5kg boxes so it might take me a lifetime to use up! I will also need to sand the tall boy. I’m after a smooth look for this and there are some areas where the current finish Is damaged so it might take some elbow grease! I have no idea when I’ll manage to find the time to work on these projects with everything else I’ve got on but watch this space! Posted on November 4, 2015 Categories UpcyclingTags Furniture, furniture renovation, painted furniture, shabby chic, upcycling, vintageLeave a comment on New furniture projects! 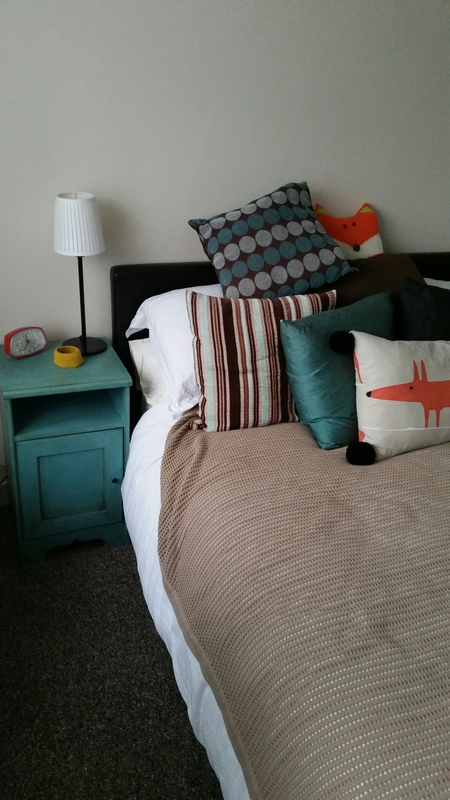 Our home contains a variety of furniture we have collected over the last 5 years from various places. Some is new, some are hand-me-downs and some are eBay purchases. Currently in our spare bedroom the furniture is either hand painted or from a matching set of Ikea pieces. All except an old bedside table that used belong in my parents’ home. For a long time I ignored this fact but recently it started to annoy me and I decided it was time to do something about it. 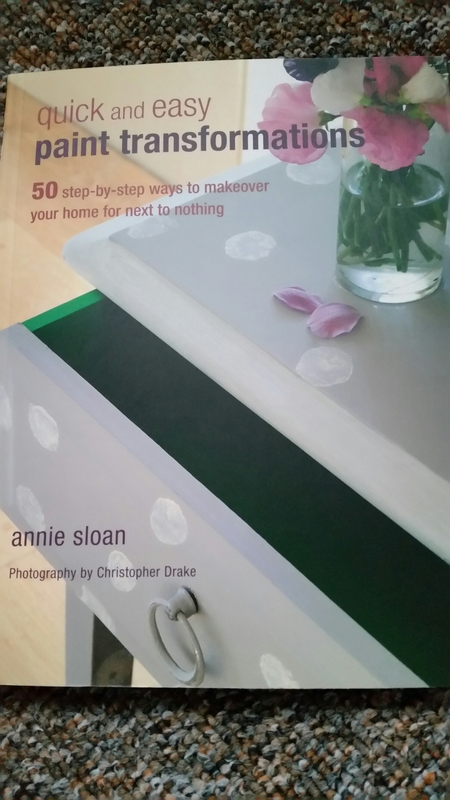 As a lover of chalk paint I had bought an Annie Sloan book some time ago but never done more than flick through it. I finally had a proper look and found some inspiration for my prospective project. On a bit of a whim (always best to strike whilst the iron’s hot with these things I find) we set off to an Annie Sloan stockist in nearby Holmfirth. This well – known Yorkshire town is full of lovely shops, pubs and cafés and is always a joy to visit. Hidden at the end of a quintesentially Yorkshire cobbled street is Lost and Found Interiors. This was the first time I’d visited the shop but I’ll definitely be back. 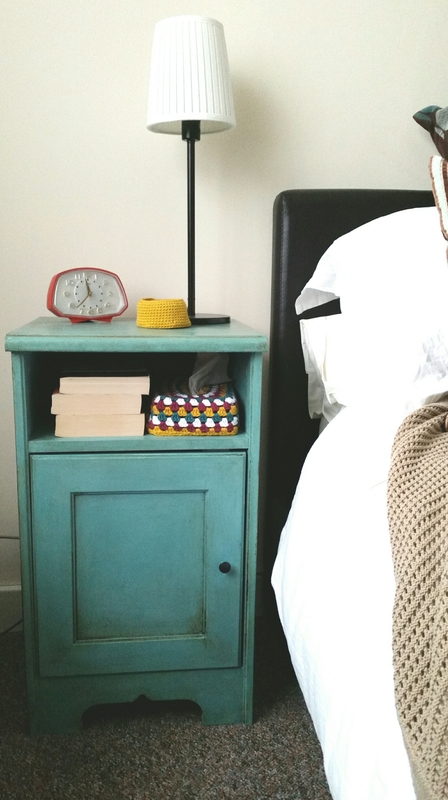 I could happily furnish my entire house from their lovely vintage and upcycled stock! I had a chat with the owner about my idea. He runs Annie Sloan workshops so was full of useful suggestions though I’m not sure he was completely on board with my planned technique! As well as the paints and wax I needed I also picked up a funky print. The next day I dug out my dust sheets, cloths and brushes and set to work. After cleaning the cabinet I started with a coat of Old White and let it dry (which doesn’t take long). In my haste to get going I’m afraid I forgot to take a before picture! Here you can see that this white coat is applied unevenly and all in different directions to get the required effect. This goes against how I’d normally prefer to do things but I found it quite liberating! 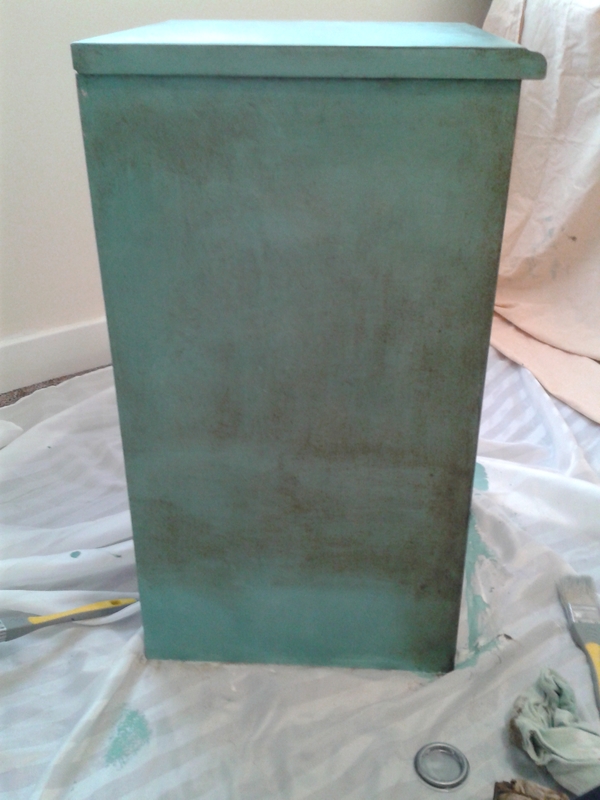 Next, on to the coat of Provence applied in the same way but without letting the white show through too much. Let it dry. The door handle isn’t painted. I covered it in aluminium foil to protect it. Originally I had planned to distress the finish next so you could see the white paint through it. I tried this on a small section and didn’t like it so didn’t do any more. Next comes the fun bit – waxing! This is where the project really comes to life. First you coat the whole thing in a layer of clear wax to protect it. Then you start to apply the dark wax. It seems a bit scary at first. Your item is looking lovely. Not yet how you imagined the finished product but ok. Then you start slapping on the brown wax and think “what have I done!” You have to keep the faith that you can do it and it’ll turn out just right! This photo shows the side of the cabinet as I was working my way down to the bottom. Apply the dark wax with a brush, making sure you work it into the contours made by the way you’ve applied the paint. Then use a cloth to get most of it off again. It dries quickly so you have to work in small sections and it takes a bit of elbow grease! If there are bits with too much dark wax and you don’t like it you can use more clear wax to help remove the excess. When you’re happy with the finish leave it to dry. It took me several hours to get to this point. 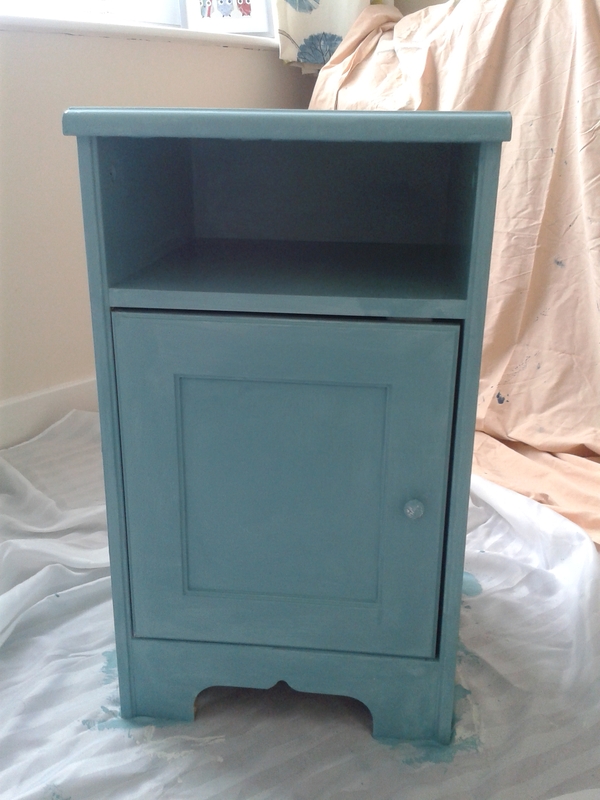 It’s quite handy though as in the drying time after each coat of paint you can go and get a few jobs done around the house (or sit and chill out with a cup of tea and a biscuit or two!). 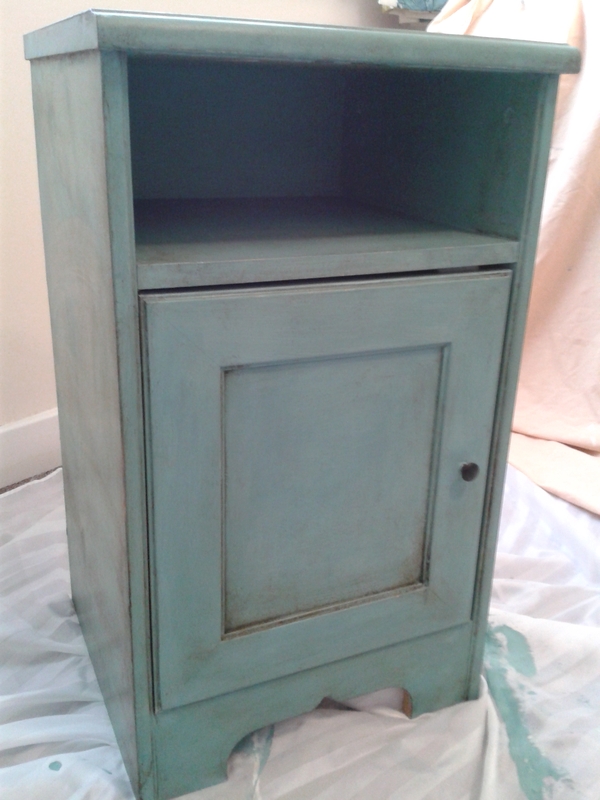 After 24 hours use a clean cloth to buff the cabinet to a nice finish which removes any stickiness from the wax. Ta-da! You’re done! Thank you for reading. Leave me a comment if you’d like. Why don’t you have a go yourself? I’d love to hear how you get on! 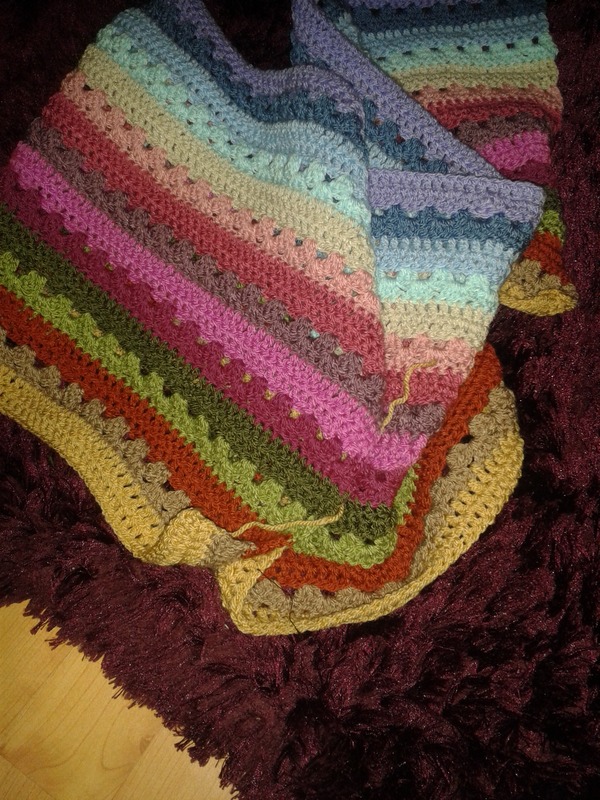 Back in January I wrote a post describing the beginnings of my Cosy Cottage blanket. Now I’m back to focusing on my blog and all things crafty I thought I’d better finish the story! 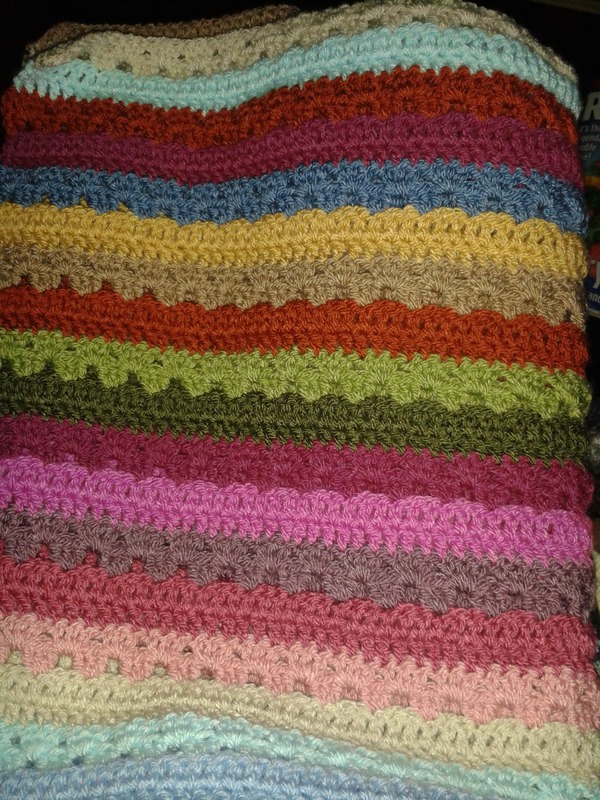 So I was using the Cottage colour pack from Lucy of Attic24’s collection from Wool Warehouse and the Cosy blanket pattern. When I last updated I’d done a bit over two sets of stripes. Instead of following one of Lucy’s plans for using the different colours I decided to make up my own. 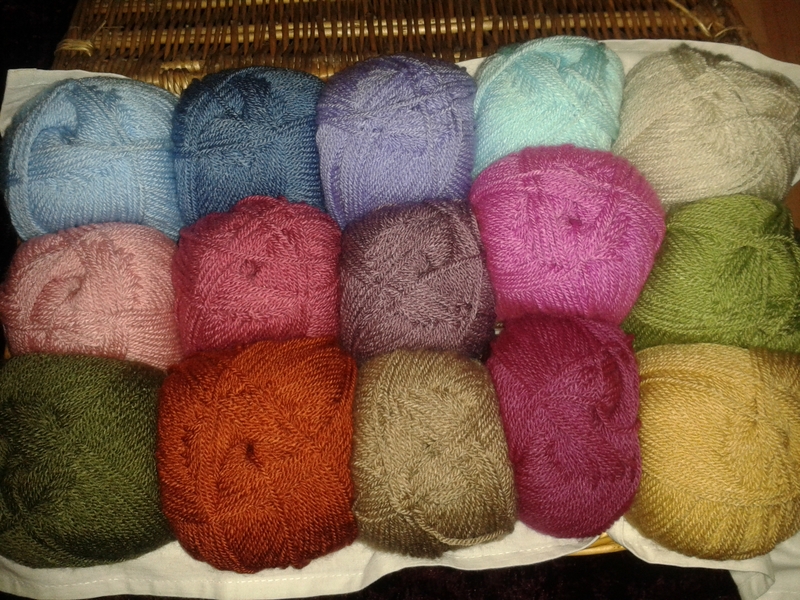 Not quite random but each colour would be used in each set of 15 stripes. Often those colour choices had to be made in the evenings when the light was less than ideal as it was winter time. When I was about half way through I loved how it looked in the winter sunshine draped over a chair. Here it’s nearly done. I was debating whether it needed one more set of stripes but in the end I decided it would be too long. I did the edging all in one day but it took aaaages! 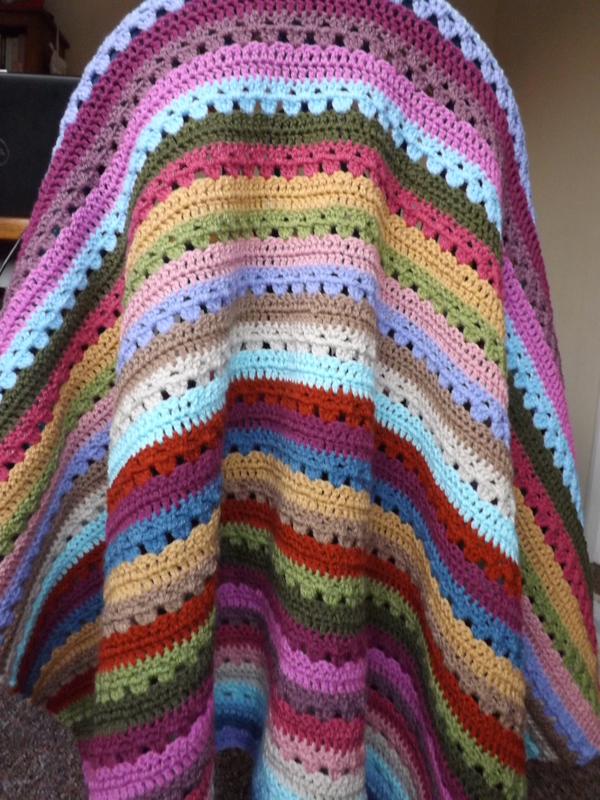 I love, love, love my Cosy Cottage blanket and was so happy to finish it although I did miss working on it when it was done. It only took about 5 weeks over all to do. It didn’t get much use over the summer but now we’re back into autumn I’m loving snuggling in it once again. 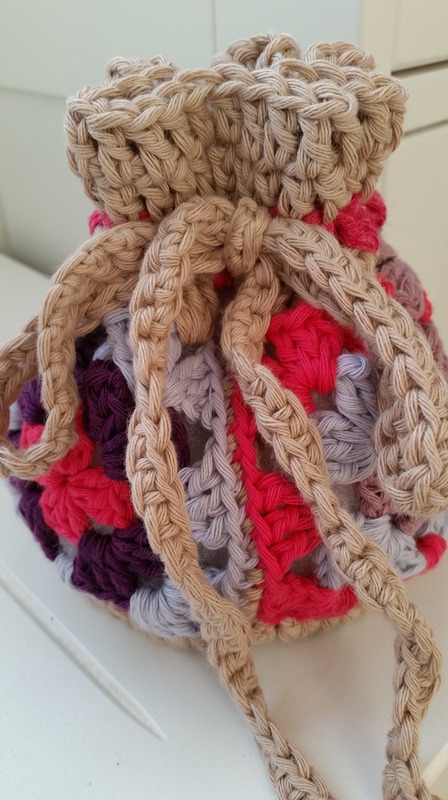 I highly recommend Lucy’s patterns from the Attic24 blog as they always turn out lovely! I am going to be teaching some crochet workshops in the New Year which is super super exciting! I’ve been looking for small, quick projects that my students will be able to complete in the full-day Saturday workshops. 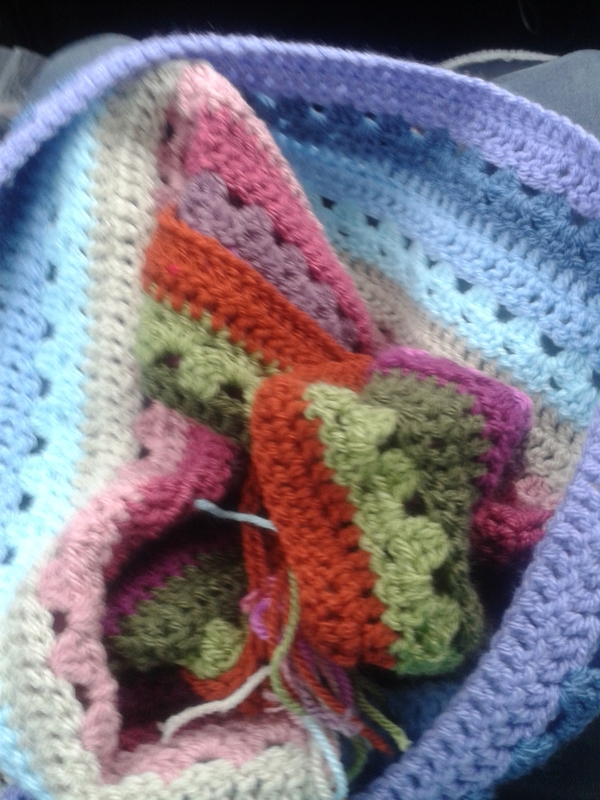 One thing I’ve been considering is a small bag made from granny squares. I managed to find a pattern in my collection. It was printed out from a website but sadly I now have no idea where it originally came from! Anyway I’ve experimented with the original pattern and adapted it to suit my needs and I think I quite like it! 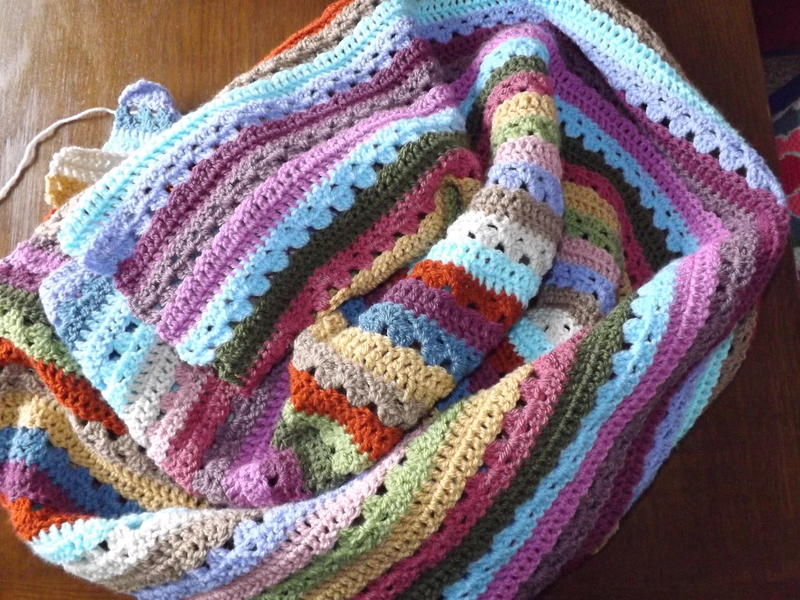 It is made from four granny squares of coordinating colours and a base and tie from a neutral shade. I’m not sure it’s the right project for the workshop in question but it’s been fun to do. For quite some time now I’ve thought I had lactose intolerance and switched to lactose – free milk and other products. I still “cheated” regularly though as I love hot buttered toast, cake, yogurt, ice cream and chocolate so I kept on having these and suffering the consequences. Bloating, stomach cramps and awful wind. Not quite “a moment on the lips, a lifetime on the hips” more “…several hours of discomfort and embarrassment!” Was it really worth it? Well recently, after a particularly bad afternoon of stomach cramps followed by diorrhea (probably TMI, sorry) after a rather tasty ice cream at the beach I decided to do something about it. So I embarked upon a strictly lactose-free fortnight as recommended by the Lactofree website. The idea is to test your theory of being lactose intolerant by cutting out lactose for two weeks during which time the symptoms should settle and then at the end of the fortnight drink a glass of normal milk and see if the symptoms return. So two weeks of deprivation from some of my favourite goodies began. I had to pretty much cut out processed food unless I was able to check they were milk – free. That can’t be a bad thing though I’m sure but it has meant being more organised to plan meals and food shopping. Again this is no bad thing – I probably saved some money. No chocolate, ice cream, cake, pizza, cheese etc. Guess what – I’ve lost 5 pounds! Another bonus. Did I feel better? Of course – no bloating and I do feel slimmer which is great. I’ve had much reduced cramps and embarrassing wind although I’ve noticed that when I have stressful situations at work my stomach seems to respond almost immediately so there’s something else going on there I’m sure. I’ve also felt surprisingly in control and determined around food. I have to admit, I’ve not really felt like that since I was really strictly doing Slimming World a few years ago. I will admit to one little cheat – we had a family day out and ate at a restaurant for lunch. There wasn’t much on the menu that was suitable so I ended up having a “posh fish finger sandwich” which came with tartare sauce which is a real fave so I did have a little of it and didn’t feel too bad afterwards. However other than that I really have been very strict with myself, knowing I wanted to complete two weeks and do it properly. I challenged myself and I feel proud that I have stepped up and done it. People have told me in the past that I’m too hard on myself but for a while I’ve felt that I’ve given up, given in or failed in some way at lots of things so it’s given me a little confidence boost too. So what happened when I had the glass of milk I hear you ask? Well about an hour or two later I started feeling the cramps. And the wind. I feel pretty rubbish as a result and will have to resort to the old indigestion remedies and peppermint tea until it settles down again. What happens next? I’ll have a challenge to keep going as we’re off on holiday soon, but I will try to keep avoiding standard dairy as much as possible. I will experiment with using lacto – free products in cooking and alternative types of milk. (I recently discovered chocolate – flavour oat milk which is yummy and a great chocolate craving – buster!). I will continue to try to plan our meals and shop smart. And I will be healthier and feel better as a result. All in all I think it was a very worthwhile exercise! A couple of weekends ago we went to Northumberland to attend a wedding and decided to make a weekend of it. 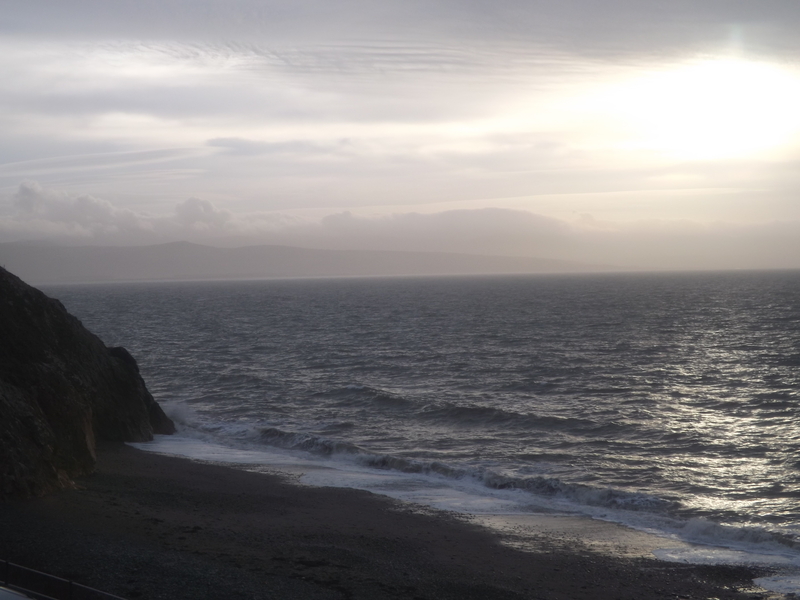 It was wonderful to have a relaxing break in such beautiful surroundings so I thought I’d share a few pictures with you. We stayed at Ash Cottage in Craster which was just lovely and perfect for what we needed. We went to the local pub for tea on the Friday night and enjoyed the last of the evening sunshine. The next morning we had a big self catered breakfast, and then went out for a short stroll before getting ready for the wedding. The wedding was at Newton Hall which was beautiful. If you ever have a chance to go I’m sure you’ll love it. The food, setting, atmosphere, decor… all amazing! The day after the wedding, there was a barbecue at Dunstan Hall where some of the other guests had stayed. Afterwards everyone started to head home but we were staying for one more night so decided to have a wander down to Craster. Can you see the crabs & lobsters? It’s a lovely little village. I’d love to show you a picture but the only one I took has a great big thumb over the lens! The sun was so bright I couldn’t really see what I was doing! We bought an ice cream then had a stroll along the coast in the direction of Dunstanburgh Castle. Afterwards we went for a cheeky pint (maybe two!) but then it started to get chilly so we went back to the cottage for a quiet night in. The following day we had planned to go to Alnwick Garden on our way home and fortunately the weather stayed just nice enough to enjoy it. First we thought we’d check out another local beach which was lovely and quiet. Just us and a few dog walkers. Bliss! (Windy as hell but bliss!). You can see Dunstanburgh Castle from the other side here. We had a little stroll down to that rocky part you can see above and then set off to the garden. We had a great time at Almwick Garden. It filled me with inspiration for my own (slightly neglected) garden. After wandering around half of it we were ready for lunch and had some of the best fish & chips I’d ever had! We then walked around the other parts of the garden. I loved the water features and sculptures. They had lots of my favourite flowers too although we were too early in the year to see the rose garden in bloom. I suspect it is quite beautiful when it’s they’re all out. Before we left we bought ice creams again – it was a weekend away, them’s the rules! It was a fantastic and much needed weekend away. I hope you’ve enjoyed this glimpse into it. 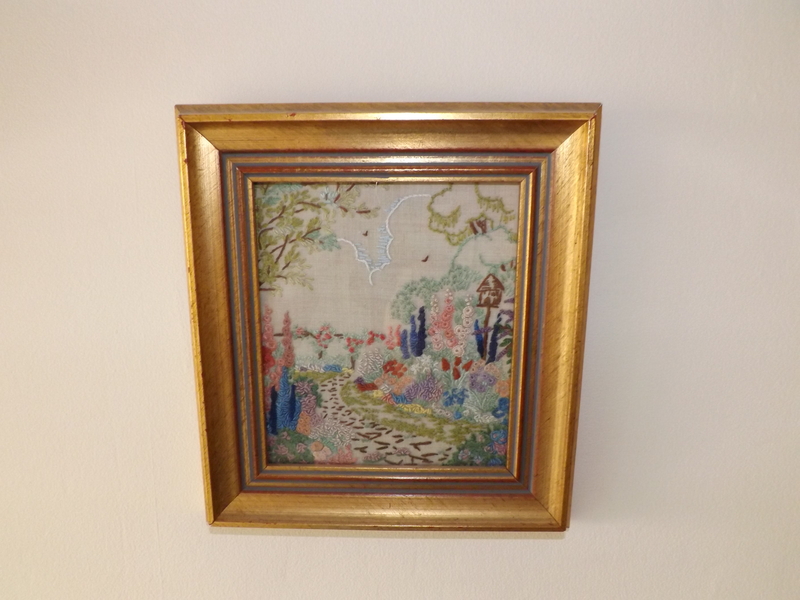 Last summer I picked up an embroidered picture from a little bric-a-brac stall at a local craft fair. 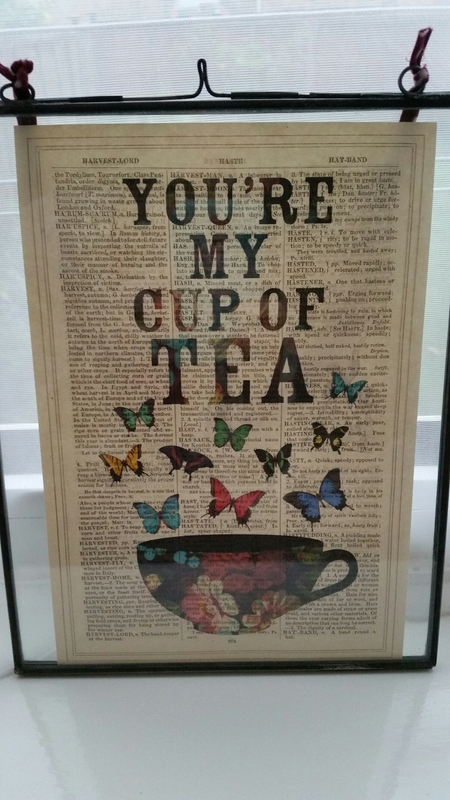 It hangs on the wall outside our bathroom and I look at it many times everyday. 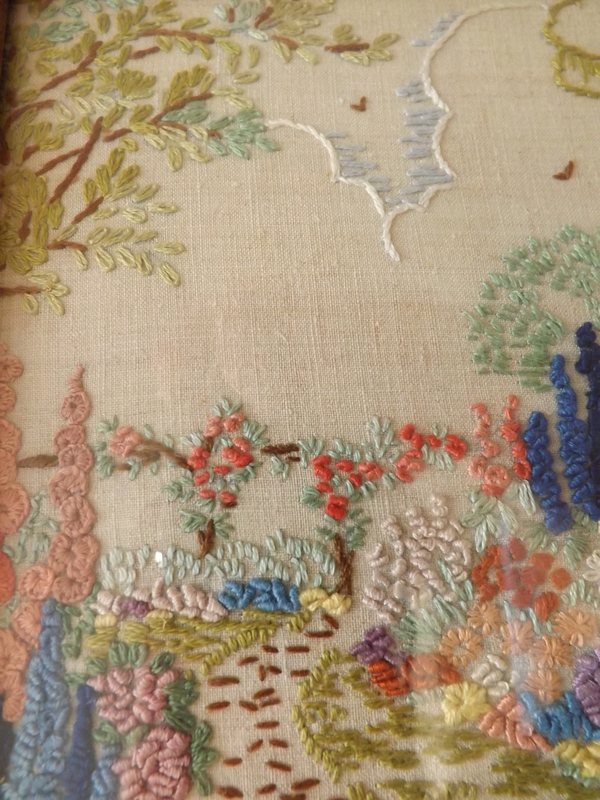 It’s a lovely garden scene with a path leading through beautiful floral borders and a bird table alongside, all set off in a lovely antique gold style frame. I often look at it and wonder who the lady was that created it? Where did she live? Did she have a family? She must have spent many hours working on it. I love the detail of the flowers and it really makes me smile to look at it. The dark blue flowers on the right are my favourite. I wonder what variety they are? I don’t really know a lot about gardening yet but I’m inspired to learn. 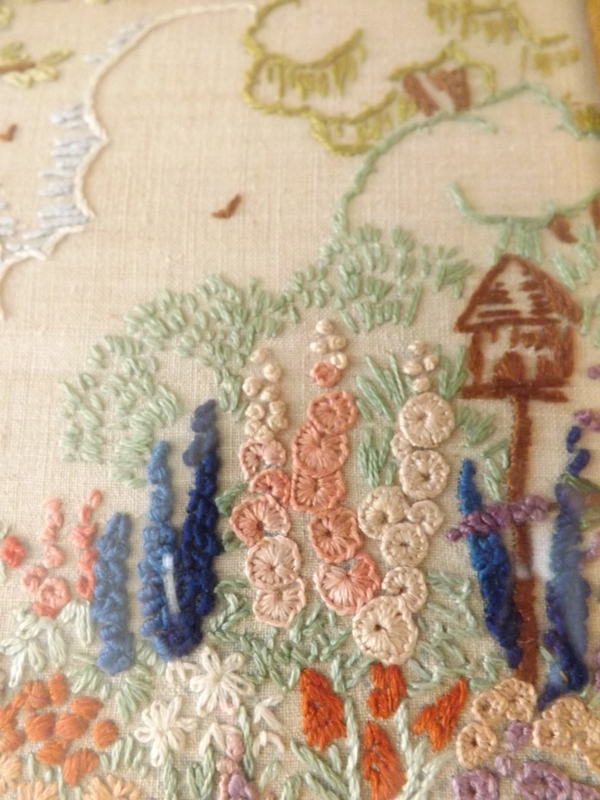 And these delicate pink flowers, so detailed. I wonder if she ever thought someone else would get so much enjoyment from it when she made it? Don’t you think it’s a wonderful testament to the fact that we all put so much time and love into our craft projects that they might get a second lease of life and be enjoyed in this way? The beauty and longevity of crafts. It really gives me a warm glow inside to think about this, don’t you agree? The first picture is me in the car on our way back from spending the new year in Wales with my partner’s family,which was lovely. We drank some bubbles and let off fire works on the beach at midnight in memory of his step-mother who we sadly lost to cancer in the autumn. New year’s eve would have been her birthday. Over the years R’s dad and his wife had started a bit of a trend locally to do fireworks at midnight on the stretch of beach in front of their house. It really is a beautiful place. 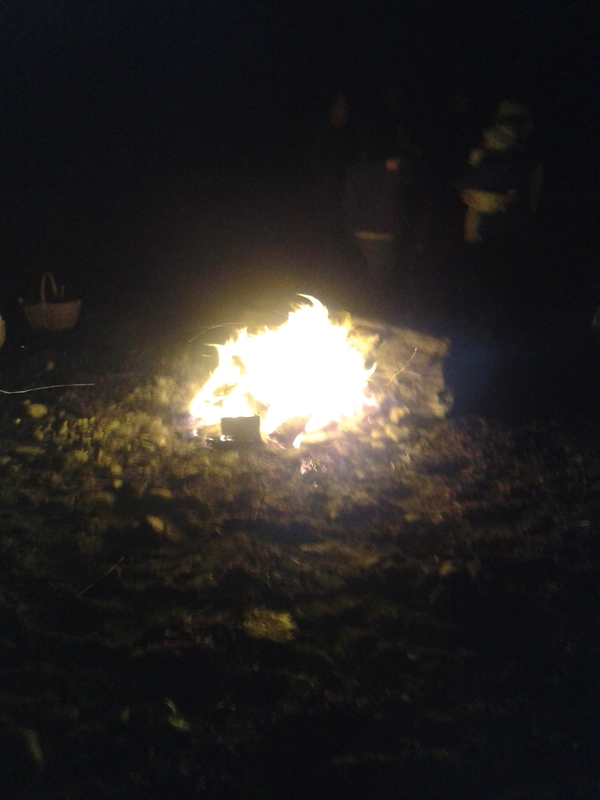 Anyway, it was lovely to see that there were already some other people on the beach who’d lit a fire. There was a lovely atmosphere down there and the weather was kind as it had been somewhat stormy earlier in the evening! This last picture was taken on the morning of new years day. So, back to the blanket. 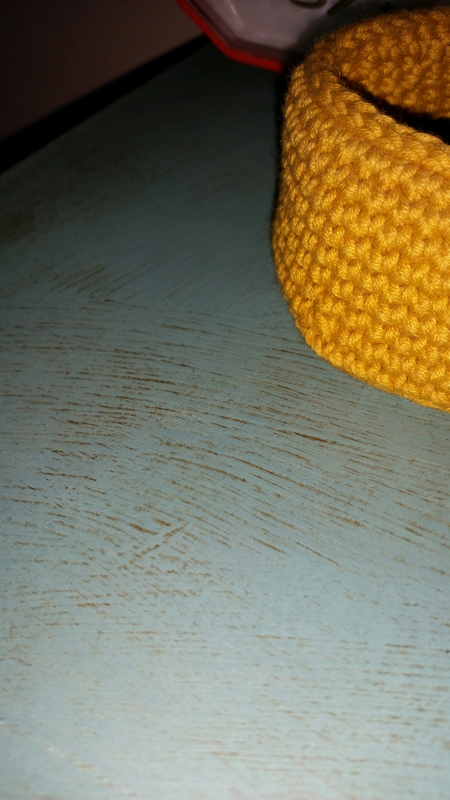 As I (may have) mentioned before, I’m doing the Cosy Blanket from Attic 24 blog which you can see here. Lucy did it as a crochet-along but as I’d asked for the Cottage pack for Christmas from my parents I thought I’d hold off and do the cosy blanket with the cottage colours instead of the cosy pack. So far I’ve done 36 1/2 stripes and I’m totally loving it. I think it looks just as good as Lucy’s version in the cosy colours. I will have to start thinking of the order for the next 15 stripes soon. I have no specific plan for the colours I’m just using my little colour pegs to work them out in batches of 15 so there’s one of each colour in each section of 15 stripes. 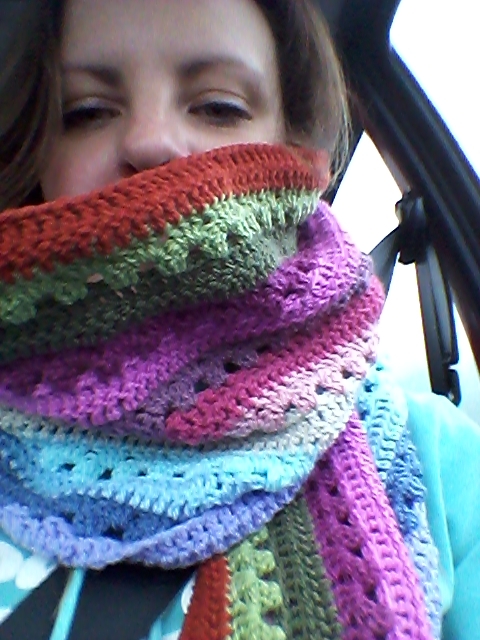 I think I’ve written enough about it now, I’m dying to make a cuppa and cosy under it to do a couple more stripes! What are you working on at the moment? I’d love to hear.